It seems from this posting that the students are included in a for profit real estate deal. Since The New York Times blew the whistle on the business practices of the Imagine charter schools, new questions are arising. Does Imagine have the right to sell the following school in Arizona with its students inside?Now that a major news outlet has finally paid attention to the business practices of Dennis Bakke and his management company (with a well-deserved round of applause for Stephanie Strom), reporters and school districts may begin to more carefully scrutinize the company's dealings. This project is a commercial building constructed as a charter school with 20 classrooms, 7 offices, 4 banks of bathrooms, lobby, reception area, 2 multi-purpose rooms, and a kitchen. 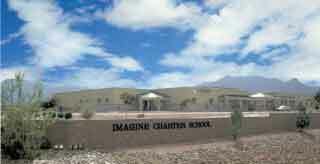 The tenant is Imagine Charter Schools, the nations second largest charter school operator. The project was designed to accommodate a future conversion to an office campus to avoid the special purpose facility disadvantages. The current office market demands $16-24/sf/year. Contact Listing Broker to find out more details.